One of the major issues generally people face is that to accomplish the task set on the to do list. This might sound as a very small task to achieve but for many it tends to a hard task. People tend to delay, issues for health, visiting a doctor or to buy groceries, meeting a friend or even a bank work. There could be many reasons for not been able to finish these tasks from procrastination, to lack of proper planning or creating unrealistic targets. To be true, these tasks are not that difficult to achieve if done properly. It is a matter of proper planning; knowing what and when is required to be processed. Further most important is to put your effort in follow the list and finish all the tasks. One of the major issue with the to-do list is that most of the people keep on adding the work in it, and do not finish the previous task mention on it. There is certain task which might not be required on the immediate basis or for that specific time period. 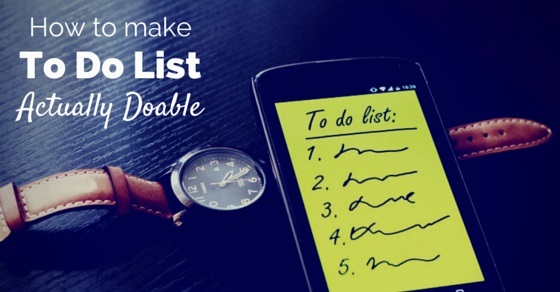 It is good to know when to stop adding that tasks on the list and start doing it, since the longer the list becomes scarier it looks and chances of ever getting it done becomes high. Another important factor is to prioritize the tasks on the lists. Mention the urgent or most important task on top and least important on the bottom. It will help you to see what is to be done on priority. Let not the important work become a load later on and spending time on the least essential one will be a waste of time and energy. Do not let the lists be there forever. It is good to set a deadline to each task and mention it next to it. Since it gives a feeling of urgency and the more you tend to avoid more it gets closer to the deadline hence pushing you to finish it up at all the cost. When in process of completing the task be focused to that job you will be doing. Finish it and then proceed to the next thing. It is easier to get distracted while doing that specific task, but it is better to focus and finish the work first before you indulge into something fascinating. Once the work will be done, it will give you more time to enjoy and relax. Sometimes there are certain things which can be done on the spot rather than adding it into a list. For example, replying to an email, it is best to reply it as soon as you read it, rather than adding it for later reply. This reduces that long scary list to work on, also prevents from the possibility of it being ignored. Everyone loves to be a boss. It is very easy to boss around people around you but it is difficult to set limits for self. Take it as a challenge and be your own boss, treat yourself as you would have treated someone else for not finishing up the task. Be strict and disciplined to yourself, initially it might seem difficult but once achieved will make your life easier. Few people tend to forget that they have even created something known as to do list and miss out on the important task to be done. It is best to set reminders on phone or set an alarm. Also it is good to post it at several places in your home and office which you will be using the most. For example, next to your computer, in kitchen, or your cupboard. This will act as a reminder that the work is to be done. When task is over, do not forget to cross it on the list. Because if not done then the chances of redoing it becomes higher, this is further waste of time. Crossing it off will remind that the task is done and the best part is when whole of the list is crossed out it will give you the feeling of an achievement. Add colours to your list, highlighting the important with one colour, least important with other. Colour coding is one of the best thing to create the feeling to get the work done. Other than that be creative, doodle around the list, colour it, fold it or whichever best creative way suits you. Don’t miss out on the reward factor; it is a best way to create a feel good factor in it. Remember the time when as a kid finishing up a task was treated by parents and teachers, that feeling of doing something worth deserving motivated you to do it better next time. It will still work even if you are a grown up. Treat yourself with small gifts when achieved or finished up the task, it will keep you motivated for the next time. When you have achieved the task in your to do list, it is good not to throw them but keep it and file it. This will be helpful whenever you feel that you won’t be able to achieve the task. Go back to your previous list and look in it, see what all you have achieved before. A glimpse into past will motivate you to do better and it will stop you from giving up. Make use of technology. With the availability of various planner apps, it is good to use them for your own benefits. These apps will help you and remind you to get a job done. Since mobile is handy with everyone at all the time, therefore, it will be a great reminding companion by your side. Another best way to accomplish your to do list is to follow the rule of 1-3-5. On any given day, list out 1 big thing to be done, 3 medium tasks to be done and 5 small tasks to be completed. It works well, since there is no over loading of the work. This will help you sort out the tasks easily. Initially one finds it difficult to accomplish the to do list, do not give up if you are not able to achieve the task. Practice and determination is the only way to achieve it. You might think, that it is not working out, but keep giving your efforts hence one day getting your to do list cleared will become a cakewalk. Another best way is to coordinate or take help from your family and friends. Share your goal with them, ask them to keep a check on you whether the task is done or not. Share the to-do list with them along with the deadlines mentioned in it. Keeping a regular check with them will encourage you to finish up your task. Most important factor of making a to-do list is know your day before you even plan it. For example, if you know that you have an important meeting on a certain day, which might take long. Better not to schedule something important on that list for that day. It is advisable to have smaller and less important tasks to get done and save time for later to wind up more important task. Points mentioned above are a way to guide you to do the best; one need to put the actual effort in doing it. Initially it might feel as a tough task even to begin with, but with persistent efforts one can easily achieve it.